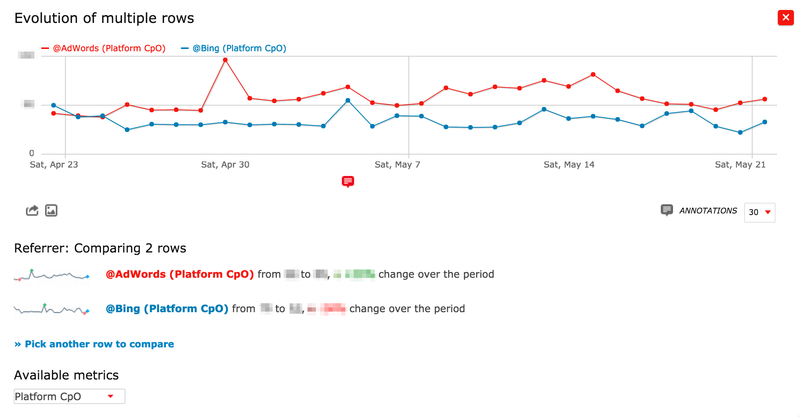 Integrate data from advertising platforms into Piwik and combine it with individual visits - create new opportunities! What is Piwik Advanced Online Marketing Plugin? 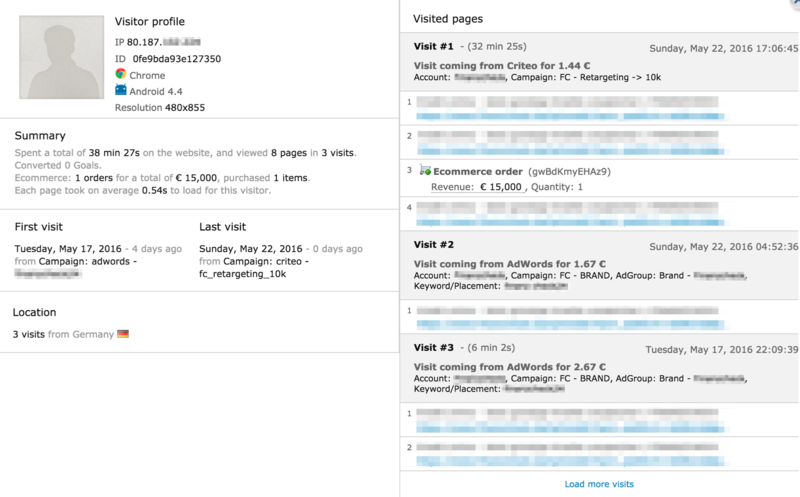 With the Piwik AOM plugin you can integrate data like campaign names, ad impressions, costs etc. from advertising platforms (such as Google AdWords, Microsoft Bing, Criteo, Facebook Ads and Taboola) and individual campaigns (such as such as cost per view/click/acquisition and fixed price per months deals) into Piwik and combine that data with individual visits. Work with this valuable data directly in the Piwik UI or use the AOM plugin's API to export data to your data warehouse. Perform customer journey analysis or evaluate your online marketing's performance when applying different conversion attribution models. Enrich your customer journey's touchpoints with advertising cost data and evaluate the RoI of every single advertising campaign and keyword! Load your customer's journeys from Piwik AOM directly into your data warehouse and conduct sophisticated conversion attribution analysis. Piwik AOM supports the integration of data from Google AdWords, Microsoft Bing, Criteo, Facebook Ads and Taboola. Additional platforms can be integrated! 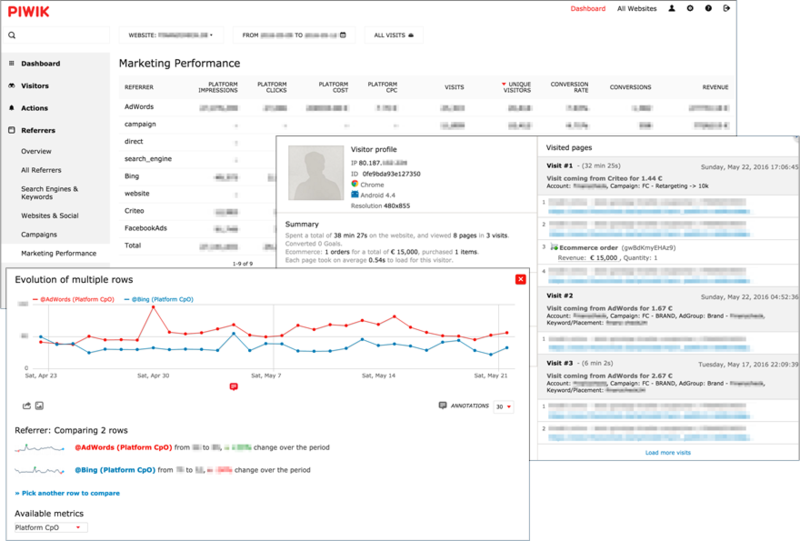 With self-hosted Piwik AOM you do not need to share your sensitive online marketing KPIs with Google or anyone else any longer. Both Piwik and the Piwik AOM plugin are free and open source; no one stops you from adapting the software to your individual requirements. You've got questions, found a bug or want to share your ideas...? Use github to collaborate with the growing Piwik community. 1. Upload Piwik AOM plugin to your Piwik installation and install its dependencies. 2. Configure API access to your advertising accounts (Google AdWords, Facebook Ads etc.) and activate the plugin. 3. Parametrize all your links at the advertising platforms you use. 4. Lay back and let Piwik AOM gather the data you need for advanced online marketing. Piwik is free software released under GPL v3 or later and so the Piwik AOM plugin is. We hope you find this Piwik plugin useful. Got questions about Piwik AOM or suggestions how to improve? Feel free to create an issue at github or contact me. Want to get more out of Piwik AOM? You miss a feature or like intense support on your individual Piwik setup? Get in touch with me and let's work out how we can make things going.